Last edited by NoisyDvL5 on Wed Nov 10, 2010 3:47 am, edited 1 time in total. With Wave 14 hitting, it's time to kick into gear and get Wave 15 done! I've got reviews of Golden Pharaoh, Sinestro Corps Batman, and the two Starmen up on the main page! Last edited by NoisyDvL5 on Fri Nov 12, 2010 6:00 am, edited 1 time in total. Last edited by NoisyDvL5 on Fri Nov 19, 2010 12:45 am, edited 1 time in total. Haha loved the Hourman review. Poor Obsidian though. Shadow Powers are no match for Matty. Before we head off for Thanksgiving break, we've got two new DCUC reviews for DCClassics.Com! 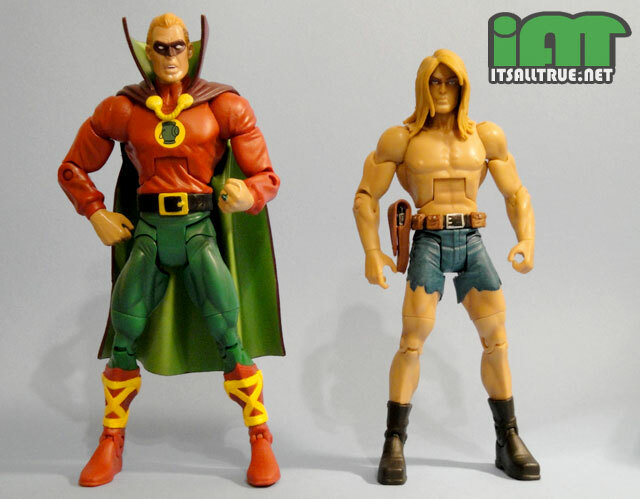 I've got a solo review of the Legion villain Tyr and Vault is helping me out and taking a look at Kamandi & Alan Scott! With Wave 14 & 15 coming out one right after the other, it gave me the opportunity to do a review of both C&C's at once! My wave 15 reviews conclude today with Validus and my wave 14 reviews continue with the Ultra-Humanite! Your reviews are one of the few I read consistently! I appreciate the effort you put in, and the funny captions to the pictures are usually quite funny! Awesome review, awesome cover re-creation, and awesome Giganta joke. I AM a Kirby lover, but since DCUC avoids homages to specific artists’ styles, I slightly prefer the DC Direct versions of Kirby characters, what there is of them, anyway. For me, the giant head takes this figure from “must have” to “can do without.” Fortunately for Mattel, the Validus is a “must have” and looks awesome with my DC Direct Legion figures, so I bought this figure anyway. Great article, though I have a minor disagreement on one point. I agree the JLU Power Ring is an epic fail, but not because he’s based on John Stewart. John Stewart is the primary Justice League GL in the DCAU, so it makes a certain amount of sense to use him for Power Ring. My complaint is the horrible costume interpretation. The one thing that’s been fairly consistent in all versions of the character in the comics is the logo. Changing it from a shield shape to a square makes it look totally generic. Other details are off, too. It could and should have been so much better! Of the three CSA figures in the JLU line, the only one that’s really successful is Ultraman. Last edited by NoisyDvL5 on Wed Dec 22, 2010 1:00 am, edited 1 time in total. That is just too perfect! Self-appointed President of the alcinde4 fan club. Green Lantern Classics came in hot on the heels of DCUC14 and those reviews have begun!